We partnered with the team at Half Your Plate for this post. 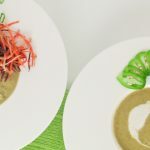 I developed this Green Curry Broccoli Soup to bring some exciting flavor to a classic vegetable soup – and I made 2 versions! It's funny how people assume that eating paleo is all about meat, but I've gotta tell you that since I've adopted the paleo lifestyle as the basis of my eating strategy I eat way more vegetables. 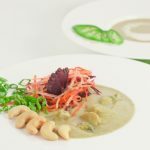 After my trip to Thailand I even tried a brief stint as a vegetarian (thought I don't think I lasted long enough to even use that term hahaha). Before discovering The Paleo Solution I had read many things about societies with the healthiest and oldest populations. 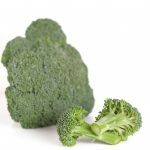 One of the common habits associated with longevity is a diet rich in vegetables. One of the pharmacies I used to work in had an educational nutrition course for interested patients and customers. 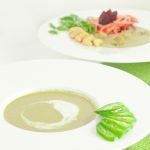 The guidelines that it used were based on the National Food Guide, which for a lot of people is an improvement on many peoples' diets, but still promotes a lot of whole grains. The vegetable portion of the plate was only 1/3 (along with 1/3 starches and 1/3 proteins). Again, it's a step in the right direction for a lot of people. Holley and I were introduced to the the Half Your Plate project a few years ago when they were just starting up. We were immediately in support of the idea. 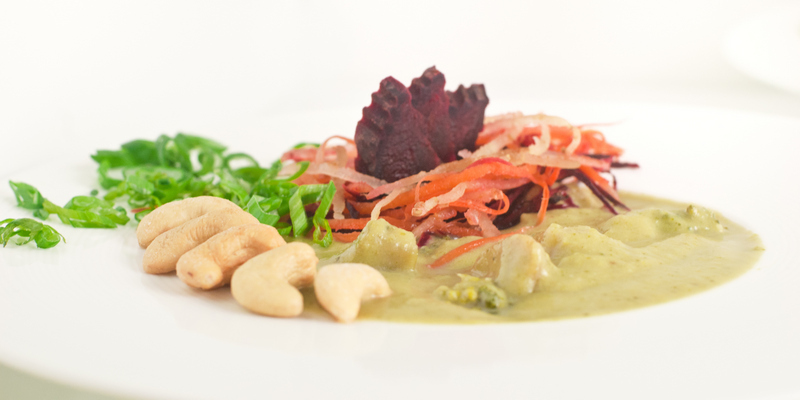 Aiming for a minimum of half your plate to be vegetables is part of our strategy eating real food in our paleo life. Make it rich in flavor and you've joined us in our wheelhouse. 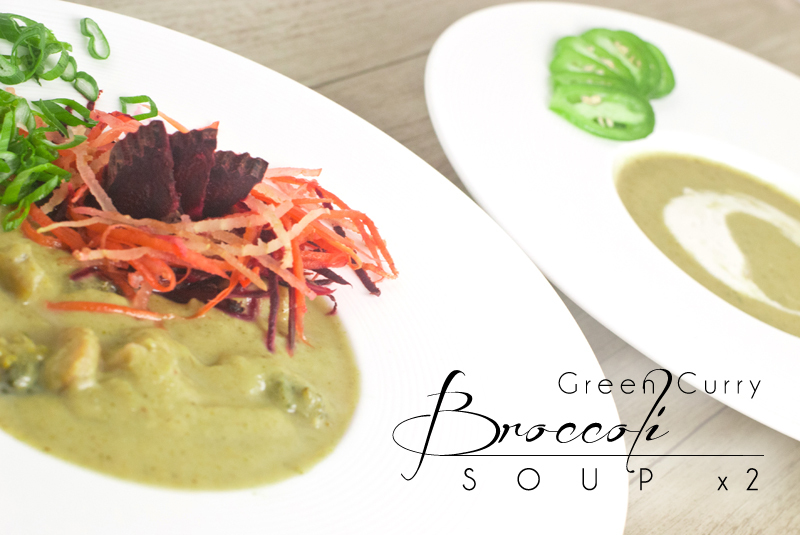 I developed this Green Curry Broccoli Soup recipe to achieve a flavorful vegetable-rich dish. 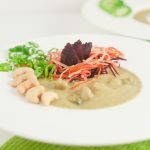 Thai curries are some of my favorite dishes for boosting my vegetable intake while keeping my taste-buds happy at the same time! In a large pot over medium heat, saute onions, garlic, and salt in coconut oil. Stir occasionally until onions are translucent. Add chicken broth and curry paste, stiring until paste is dispersed. 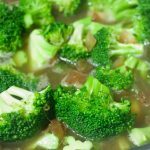 Add broccoli (include chili peppers, kaffir lime leaves and lemongrass if using), increase temperature to high until boiling, then reduce to simmer for about 20 minutes (broccoli stems should be soft). Stir in coconut milk, lemon juice, and fish sauce (taste test here and ensure the flavors are balanced, including salt). 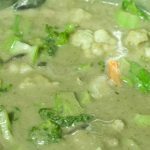 Now it's your choice: stay with this Creamy Green Curry Broccoli Soup, or add some more bulk with bonus vegetables (see recipe below for second option). Optional: add in a dollop of coconut whip cream once served in bowl (it looks pretty and adds some extra creaminess). 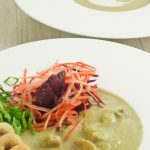 A creamy Green Curry Broccoli soup is great, but why not add more vegetables for a little extra substance? (optional) any other veg! I recommended trying mushrooms, bell peppers, potatoes, etc. 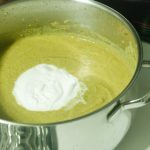 Add all vegetables except green onions to the creamy soup from above and allow to simmer until vegetables are desired texture. Stir in green onions, or sprinkle on top and enjoy! We were compensated and this post was sponsored by Half Your Plate. « The Waiting Game – What’s happening with my thyroid gland? Aimee! Congrats on making the 4 week challenge (and thanks for encouraging us to do it)! 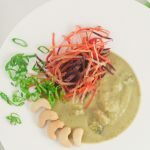 The lemongrass and lime leaves are in most green curry pastes, but I find adding more fresh or frozen adds quite a bit of depth to the flavor. I’m sure you’d be able to find some in an Asian market, a large grocery chain (north of the border I think the Real Canadian Super Store carries them in the produce and possibly the frozen food section), or maybe even Amazon. Without using these ingredients… in theory you could add a little more paste, but as I said I find the fresh/frozen ingredient adds that extra complexity to the flavor profile. Love that you have included 2 variations of the soup. It sounds amazing! And even though they seem so similar, they are quite different experiences. People think being vegan and paleo are complete opposites, but a healthy vegan diet is probably what most of our ancestors ate along with the occasional meat. Nice to hear that you increased your vegetable consumption. Have you heard of “Pegans”? The Paleo-Vegans? I love when those of us with different food views can connect on our core values of real food that is delicious! Thanks Janet! I really want to try the chunky version – the more vegetables, the merrier! Thanks Taylor! Your HYP Cantaloupe and Cucumber Pops look great too! Just finished making the second version. Did not have lemon grass or lime leaves, but it is a very tasty pot of soup. Dad is enjoying a big bowlful after playing hockey this morning. We both really like the flavours. Thanks, Raj!